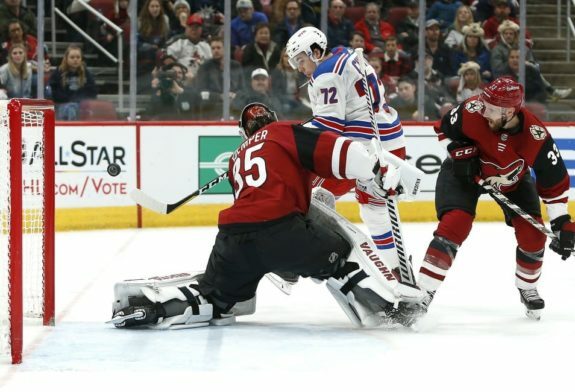 GLENDALE, Ariz. — Rookie Conor Garland scored twice, Darcy Kuemper made 23 saves for his first shutout of the season and 12th overall and the Arizona Coyotes beat the New York Rangers 5-0 on Sunday to end a three-game losing streak. Alex Galchenyuk had a goal and two assists, and Mario Kempe and Clayton Keller also scored to help give coach Rick Tocchet his 100th NHL victory. The Coyotes won for the second time in their last nine home games. Galchenyuk has 10 points in his last eight games, and Garland has three goals in his last two games and five in his last seven. Garland was recalled from Tucson of the American Hockey League early last month. New York goalie Henrik Lundqvist stopped 27 of 32 shots before being replaced by Alexander Georgiev with 3:22 left in the second period. Lundqvist also was pulled in his last start, a 7-2 loss to Pittsburgh, on Wednesday night. The Rangers have been outscored 18-3 while losing three straight games and have lost six of eight and nine of 12. They were shut out for the third time this season. Garland opened the scoring at 7:19 of the first period on a power play, tipping in Oliver Ekman-Larsson’s shot from the blue line. The Rangers have given up four power-plays goals in the last two games — three in a 6-1 loss at Colorado on Friday night. Garland struck again at 6:34 of the second. His shot from the slot deflected off Kevin Shattenkirk’s stick and fluttered past Lundqvist. Galchenyuk’s poke check at his own blue line started the rush. Keller and Galchenyuk added goals in period, with Keller’s shot through the five-hole sending Lundqvist to the bench. NOTES: Rangers centre Kevin Hayes, who is second on the team with 34 points, did not play for the second straight game. He suffered what is believed to be mid-body injury when he ran into the boards in a Dec. 14 game against the Coyotes. … The Rangers played the eighth game of a stretch in which they are to play 12 games in 23 days in four time zones. They are 2-4-2 thus far. … Kuemper’s mask was knocked off by Brandon Smith’s wrist shot 1:30 into the second period, and play was stopped while he got a new one. … The Coyotes swept the two-game season series after overcoming a 3-0 lead for a 4-3 overtime victory in New York on Dec. 14. … The Coyotes had 17 shots in the first period, a season high.